Content is not reiterated from a third party; all content is fresh, research-driven, and uniquely created. For instance, you can learn about content marketing trends, get tips on job interview questions, understand keys to happiness in the work force, check out the latest on professional opinions regarding the economy. Really good stuff! It's FREE! Join the community, browse the content, and receive members-only access to the infographic vault! Who doesn't love a few great infographics? The initial sign-up takes about 8-9 minutes to fill out professional info, demographic info, and preference selections. Earn rewards and influence brands by offering your opinions; completing surveys earns you points and points can easily be redeemed for gift cards/gift codes (Amazon.com and iTunes, for example). Survey results help to mold the best up-to-date content. ProOpinion is for professionals who want their influence to go farther via smart research. It is for professionals who want updated and interesting content related to the working life. It's also for people who love infographics and those who love to earn rewards for doing something engaging (taking surveys) for a just few moments at a time. 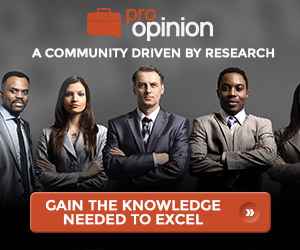 Your search for research that matters to you stops here - join ProOpinion today.